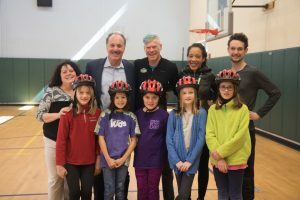 Attorney Marc L. Breakstone helped deliver new bicycle helmets to Arlington fifth graders this week. He asked them to make a promise: to ride safely and always wear their helmets when riding to prevent head injuries. “Now I’m not here to scare you. I’m here to inspire you, okay? … I want you all to be safe bicyclists,” Breakstone said. 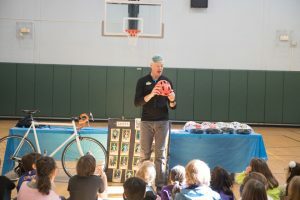 The bicycle helmets were a surprise gift for the 50 students at Pierce Elementary School’s bike safety training. MassBike, Massachusetts Safe Routes to School and the Arlington Police Department participated. During his talk, Attorney Breakstone spoke to the students about the impact of concussions and his experience as a personal injury lawyer who has represented cyclists who have suffered head injuries. “A concussion can affect you for your entire life,” he said. Francis covered a number of safety topics, including riding on sidewalks near pedestrians, hand signals and developing a routine. “Be predictable when you ride your bike,” he said. 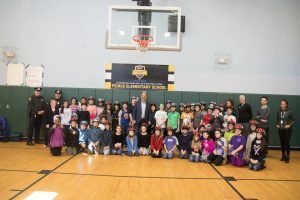 Since 2013, Breakstone, White & Gluck’s Project KidSafe campaign has donated more than 20,000 bicycle helmets to children in eastern Massachusetts. We kicked off the 6th year of our safety campaign in Arlington this week. It was our fifth year supporting Pierce Elementary School, where there are no school buses. Students walk, ride bicycles or are driven by their parents. Through Project KidSafe, we are committed to helping children and families put on bicycle helmets. From our experience as attorneys and cyclists, we know helmets are critical to preventing concussions, traumatic brain injuries and deaths. We want to prevent injuries. For the next few months, we will be working with community partners throughout the Boston area to donate bicycle helmets and educate families about bicycle safety. Each helmet meets safety standards set by the Consumer Product Safety Commission and will be fitted by one of our attorneys or community partners. Read about the donation in The Arlington Advocate. At Breakstone, White & Gluck, our Boston personal injury lawyers fight for justice for those who have been seriously injured or killed by the negligence and wrongdoing of others. Please visit our website to learn more about our Project KidSafe campaign and our attorneys, Marc L. Breakstone, David W. White, Ronald E. Gluck and Reza Breakstone. Photos, left to right: Mary Alice Vallarino, parent and event organizer, Attorney Marc L. Breakstone, Tom Francis of Mass Bike, Nicole Edmonds of Massachusetts Safe Routes to School and Macon Lockery, of The Bike Stop in Arlington.